The findings therefore suggest that blocking the ability of nucleic acids to induce Th2 maturation could be a promising possible therapeutic approach to reducing the severity of allergies in humans. The immune system produces various types of immune cells—some are pre-programmed to target pathogens that the immune system has previously encountered, while others are ‘naive’ and retain the ability to mature or differentiate into specific cell types to target new invaders. Some of the triggers of this differentiation, however, remain poorly understood. Takashi Saito, Takayuki Imanishi and colleagues from the Laboratory for Cell Signaling at the RIKEN Center for Integrative Medical Sciences have now led an international team of researchers that has found that nucleic acids, such as DNA and RNA, released from dying cells can trigger naive immune T cells to differentiate into T helper type 2 (Th2) cells. The researchers performed a series of experiments where naive T cells were cultured with different kinds of nucleic acid species to induce T-cell activation. They found that certain classes of nucleic acids that tended to interact with other nucleic acids were more effective at activating T cells, suggesting that these structural interactions enhance nucleic acid stability and uptake. Nucleic acids bound to various antimicrobial peptides and proteins—typical of the nucleic acids released by dying cells—also tended to promote T-cell activation, indicating that activation occurs at sites of inflammation or infection. In many types of immune cells, nucleic acids bind to a class of proteins called Toll-like receptors (TLRs, which sense pathogen-associated molecular patterns to initiate innate responses and help regulate T cell-mediated adaptive immune responses. The researchers were surprised to find that TLRs did not seem to play a role in nucleic-acid-driven T-cell differentiation. Instead, the researchers found that exposure to nucleic acids induced in the naive T cells initiates the expression of a transcription factor that is known to specifically drive Th2 maturation. This was evidenced by the secretion of proteins characteristic of Th2 cells when naive T cells were cultured with nucleic acids. Th2 cells drive the immune response against parasitic worms and serve a key role in triggering allergic reactions. The findings therefore suggest that blocking the ability of nucleic acids to induce Th2 maturation could be a promising possible therapeutic approach to reducing the severity of allergies in humans. 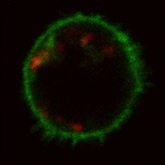 Illustration: DNA (red) is taken up inside naive T cells (green), leading to their activation and differentiation into T helper type 2 (Th2) cells. –Reproduced, with permission, from Ref. 1 © 2014 T. Imanishi et al.